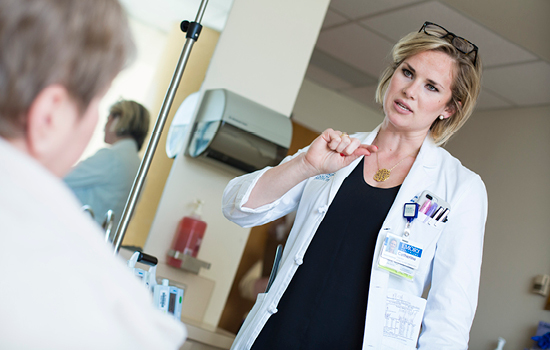 Catherine Caprara credits her patients with shaping her career path as a nurse practitioner in Emory's BMT unit. 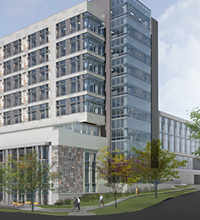 When Emory University Hospital's new tower opens this summer, Catherine Caprara 15MN will be among the dozen advanced practice providers and 50 nurses who will move into the bone marrow transplant (BMT) unit's new space across the street from the main hospital on Clifton Road. The move is good news for the 45 to 50 patients at a time who typically stay in the hospital two to six weeks, depending on their type of transplant. With 48 beds on 9T North, the unit's new 36,959-square-foot home will more than double its current space and better accommodate patients. Currently, about half are in the BMT unit on 8E and the rest in various other units throughout the main hospital. The new Emory University Hospital tower will begin opening in late July across the street from the main hospital. All nine floors will be up and running by late October. The move also promises many benefits in the challenging BMT environment where Caprara oversees patients undergoing chemotherapy and active transplant or manages complications following their transplant. "Working in this unit requires meticulous attention to detail, while balancing a holistic approach to the patient and the family's needs," she explains. "It takes a highly skilled, interdisciplinary team to coordinate a transplant, including nurses, physicians, advanced practice providers, pharmacists, and social workers. Having our patients on the same unit in the new tower will allow for highly skilled and experienced BMT nursing staff to closely observe and care for them." The new BMT unit's nurse call system will support enhanced communication among patients, families, and staff. A visitor management system will help control access to the patient care area. Unit corridors will consist of alcove spaces throughout with alternating wash stations and computer workstations as well as spaces for personal protective equipment such as gloves, isolation gowns, eyewear, and masks. Being able to better serve BMT patients in the new nine-level tower is another good reason why Caprara calls 2017 her year of gratitude. Growing up in Atlanta, she knew Emory's reputation and embraced the chance to join its medical community when she graduated from nursing school in 2012. She was selected for Emory's six-month residency program, which provides focused training and education for newly minted nurses in the specialty for which they are hired. Within her first month of starting as a nurse in oncology, she felt a deep connection to the specialty. "Suffering recalibrates someone's world. The bedside nurse is privileged to journey with his or her patients and help navigate some of their most difficult undertakings," Caprara says. "I learned what a tremendous impact that a caring and committed nurse can have on the lives of patients and families." In 2014, Caprara decided to transition from bedside nursing to the "head of the bed" as a nurse practitioner. Awarded the Sabrina Williams Scholarship for Continuing Education, she spent 18 months balancing classes five days a week at the School of Nursing, doing graduate clinical rotations, and working weekend shifts as an RN. By December 2015, she had completed her MSN in adult-gerontology acute care. The skills and knowledge acquired in her graduate studies provided the foundation for a lifetime as a nurse practitioner, but she credits her patients for molding her into the oncology care provider she is. Now approaching her one-year anniversary as a BMT nurse practitioner, Caprara readily embraces the lifelong responsibility of mastering the art of her evolving profession. She recently completed her post-master's in hematology. Her next goal: studying for the boards to become an Advanced Oncology Certified Nurse Practitioner. The hardest part of her job is finding an emotional balance amid a heartfelt investment in her patients. "There's undoubtedly a significant emotional toll associated with this field," Caprara says. "How can there not be, considering? It's similar to being on an airplane—you have to don your oxygen mask first before you can be of help to anyone else." Whether volunteering as a school nurse at Cristo Rey High School in downtown Atlanta, making handmade pasta in cooking class, or cultivating her love of dance at the Atlanta Ballet, she knows that taking care of herself helps her recommit to her patients "110 percent" when she returns to work. "I absolutely love what I do and am blessed to collaborate with a nursing staff and medical team that shares this passion," she says. "There's nursing and there's oncology nursing, and those who understand the difference will tell you it's a life-changing privilege." Way to Go, School of Nursing!